The Arizona Coyotes missed the Stanley Cup Playoffs for a sixth straight season, but their youth gives them an opportunity for a quick improvement. Of the eight Coyotes to score at least 30 points last season, five were 22 or younger as of Feb, 1, 2018. 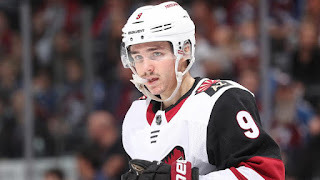 That includes 20-year-old forward Clayton Keller, who led the Coyotes with 65 points (23 goals, 42 assists) in 82 games. It also includes Max Domi, who scored 45 points (nine goals, 36 assists) and was traded to the Montreal Canadiens on June 15 for Alex Galchenyuk, who scored 51 points (19 goals, 32 assists). The Coyotes had a combined 252 points from players 22 and under, second to the Colorado Avalanche (270), more than double the NHL average of 120. The 252 points were an NHL high 45.6 percent of the 553 points scored by Arizona players. The Coyotes have struggled at 5-on-5 but are trending in the right direction. Over the past three seasons, the Coyotes have been outshot 11,900-10,414 in 5-on-5 shot attempts for a SAT of minus-1,486, and an SAT percentage of 46.67 percent, each last in the NHL. This disadvantage is confirmed by their offensive zone start percentage of 45.88 percent, which also ranks last. Arizona addressed this by phasing out the players with the worst results. Of the six Coyotes with the lowest individual SAT over this time span, only defenseman Alex Goligoski (minus-491) remains. Consequently, the Coyotes improved their SAT from an NHL-worst minus-750 in 2016-17 to minus-298 in 2017-18, which ranked 23rd. Over the past three seasons, the Coyotes have a power-play percentage of 17.0 percent and a penalty-killing percentage of 77.9 percent, which adds up to a special teams index of 94.9 percent. In each regard, the Coyotes are 30th behind the Ottawa Senators at 16.5 percent, 77.2 percent and 93.7 percent. The Coyotes have scored 146 goals on special teams (132 on the power play, 14 shorthanded) and allowed 205 (174 on the power and 31 shorthanded), for a net differential of minus-59 goals. In 2017-18, they ranked 23rd with a special teams index of 96.3 percent, and a net differential of minus-13 that was tied for 25th. With the addition of forward Michael Grabner this offseason, the Coyotes may improve even more. Over the past three seasons, he has taken an NHL leading 66 shots while shorthanded and ranks third among forwards with 540:08 killing penalties.